Please note that the content of this book primarily consists of articles available from Wikipedia or other free sources online. 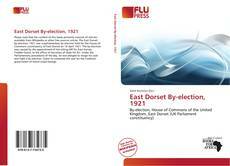 The East Dorset by-election, 1921 was a parliamentary by-election held for the House of Commons constituency of East Dorset on 16 April 1921. The by-election was caused by the appointment of the sitting MP for East Dorset, Freddie Guest, to the office of Secretary of State for Air. Under the Parliamentary procedures of the day, he was obliged to resign his seat and fight a by-election. Guest re-contested the seat for the Coalition government of David Lloyd George.